Looking to become more involved? Become an owner or investor in Katie’s string of competition horses! Receive regular updates on competitions and how each horse’s training is progressing through email, photos and a year-end report. Currently, Katie is looking for a few dedicated individuals to join her in owning both Mr. Indiscretion and Absolute Addiction. Learn more about both these horses. The costs involved with campaigning an elite eventer range from $10,000 for a lower-level horse, such as Absolute Addiction, to $30,000 for an upper-level horse, such as Mr. Indiscretion. At Rock Solid Training, we’re looking to build up a team of dedicated individuals. If you want to become involved, but don’t know where to start, consider sponsoring one of Katie’s horses for a month, a year or even a single competition. 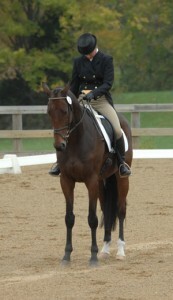 You can sponsor Katie at a local Horse Trials for as little as $400, or at a major international competition for $800. OR pay for Katie to take a lesson with one of her valued instructors for $100. Should you not be able to attend the competition, Katie will send you a full report, complete with photos and video! Donations can be tax deductible when made through the American Horse Trials Foundation (contact Margaret at sponsorships@KatieWherley.com for more info), or directly to Katie at Rock Solid Training; 6950 Burkittsville Road; Middletown, MD 21769. Looking to make a bigger commitment? Become an investor! Investors purchase a horse with the help of Katie, and the horse then stays in training at Rock Solid Training. Katie will keep the horse in training and market him as appropriate. The investor is responsible for all routine expenses including reduced board, veterinary and shoeing costs, competition entry fees, etc. Upon the sale of the horse, any profit will be split between the investor and Katie. Interested? Contact Katie directly at wherleyk@gmail.com.